Canto Libero is without a doubt the best Lucio Battisti performance on the market. I have followed them for the previous 2018 Teatri Tour and photographed them for the whole year. For this tour, I am producing a serie of videos connecting the audience of now with the memories and emotions of the great Lucio Battisti, who passed away twenty years ago. 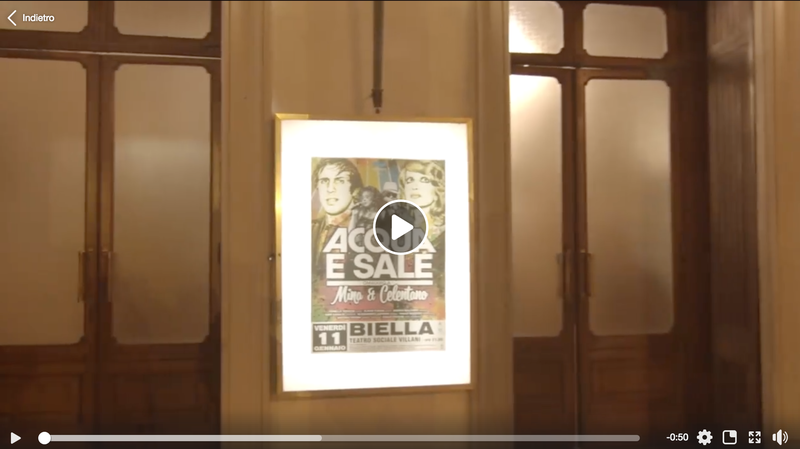 From the same management as Canto Libero, Acqua e Sale is a tribute to the golden years of Adriano Celentano and Mina, brought to life by comedian Flavio Furian and his wife Ornella Sabatini. I have been producing and editing small 2min trailers about their ongoing tour. I started in the summer of 2017 a collaboration with longtime friend Nicola aka L'Iperuranio aimed at building video content and promoting his upcoming album Postimpressionismo. Between videoclips, outtakes and acoustic sessions, the album is moving towards the light and into the stores. Starring: Nicola Bertocchi, Anna Marafatto, Giacomo Cinque, Alessia Bressan, Gabriele Balestra, Irene Apigalli, Giovanni Tommasini, Annabel Napolitano, Alessia Meden, Angelica Vascotto e Ylenia Bursich. Produced and recorded by Nicola Bertocchi, Alberto Bravin, Daniele Dibiaggio and Nicola Ardessi. Nicola Bertocchi: Vocals, Acoustic Guitar. I have known the Fireplaces since I crashed into Caterino during Jake Clemons living room concert in 2014, and later for their support to the Light of Day foundation. While they were touring New Jersey we took the chance and improvised a busking session in Union Square's L station. The Eight Million Audience is a documentary project spotlighting music performers on the subway platforms of New York. Through a visual and audio voyage in the underground network of the city the project aims to unveil the life and talent of unrecognized musicians who perform every day in front of an audience of thousands. Modern street performance goes back to the folk and blues revival of the 1960s. Examples include B.B.King playing in towns along The Mississippi River, Tracy Chapman playing in Harvard Square in Boston and Jewel traveling all across America with just a guitar and a knife. On the other hand, artists that have already achieved fame, like Bruce Springsteen or Bono, still enjoy playing in the streets, sometimes for a cause and sometimes just for the fun of it. New York has a love/hate relationship with street performers. For more than a hundred years, since the opening of the first subway line in 1904, various administrations have tried to regulate or prohibit underground performances as well as on the streets, while artists and activists have reclaimed the right of free speech by occupying public spaces for performance. The subway network of New York is the beating heart of the city. Millions of people ride the trains everyday, in a routine made of chrome, cement and noise. The prowess of these musicians can shake the passersby from out of their routine, make them stomp their feet and miss the train, creating an electric pulse for the sleeping souls of commuters. Through a video based non linear narration I aim to portray stories from this culture as a significant part of the city fabric. My intention is not to bring the artists to bigger stages and audiences but to express the beauty, neglect and impermanence of this cultural reality in New York. The Eight Million Audience - Teaser from Francesco Chiot on Vimeo. Luca Ciut - Are dreams overvalued? While Dancing with Maria's soundtrack was playing in screenings all across the globe, Luca took time off to play a secret concert in Ljubljiana's Daktari club. From an idea of Martina Marafatto we organized a quick intimate session that brought the lights, sound and orchestra of the big stage into a very intimate space.